SteamWomen: SW7: Jocelynne Simone, AKA Madame Askew, and the Art of Tea Dueling! SW7: Jocelynne Simone, AKA Madame Askew, and the Art of Tea Dueling! 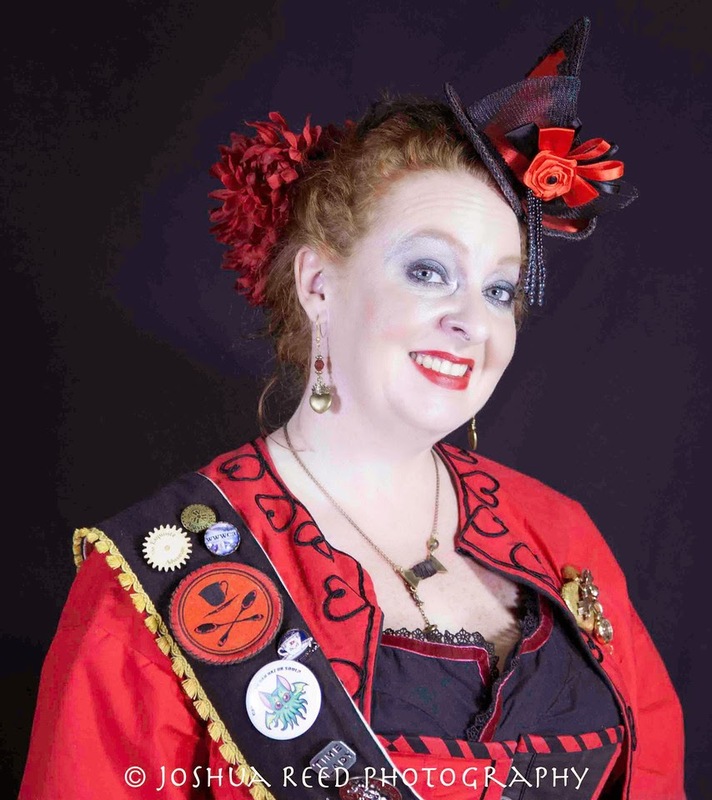 This Monday's blog features the irrepressible Madame Askew, time traveler, tea enthusiast, and proponent of the fine art of tea dueling, where one settles differences with tea and biscuits rather than bullets and guns. 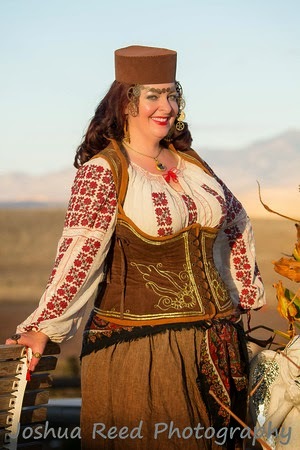 She is also known for her clothing construction and corsetry, as Lady in Waiting Fashions. 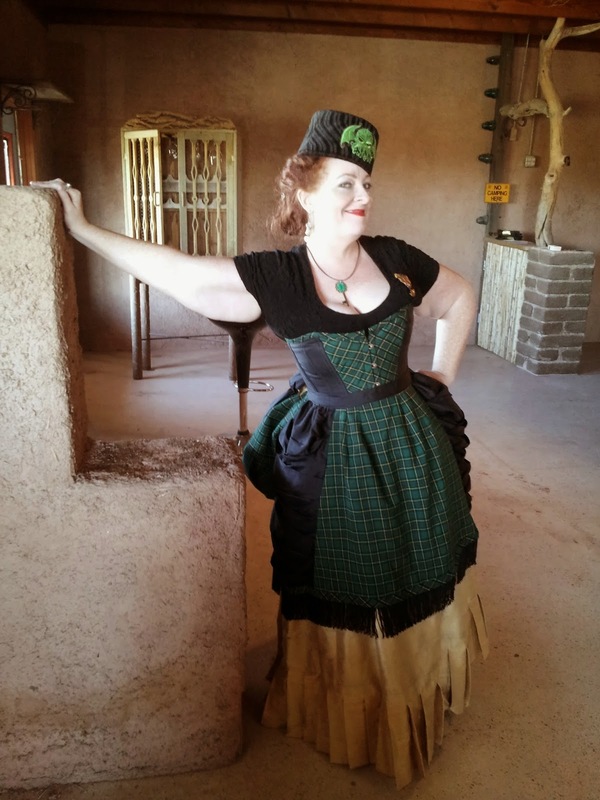 Making her home in Tuscon, Arizona, Madame Askew has wielded her teapots at Wild West Con, AetherFest, and other steampunk conventions. I think I start from a place of optimism. I always endeavor to find the very best in the people around me, the experiences of my life and the places I visit. I adore people as individuals in the vast myriad of unique ways each person exists. Interacting with people, creating spaces of laughter or inspiration really feeds my soul. My, an extrovert, and it certainly shows! Nothing picks me up after a bad day quite like spending quality times with a friend or group of friends. It’s rare that I want to hide away and hibernate though it does happen. For all of my love of spending time with people and my excitement for life, I am fundamentally an artist which does mean a great deal of time spent working in a solitary environment. Long ago I had a vocal coach tell me that for some of us to be happy in the world, we would always need to do some type of art, in some manner. I have found this to be very true, and I have been fortunate to have my life filled with both the performing and creative arts, especially in recent years. Not only do I have the opportunity to build costumes and see them grace the bodies of many wonderful people, but I also get to stand before small bands to large crowds of people and entertain them with my merry band of tea drinking fiends. Given that I pursue art as well as volunteer in my local community extensively, I am grateful that a final facet of my character is that I am what some might charitably call driven and others might describe as a workaholic. I love doing and filling my life with acts of creativity, giving and performing. I firmly attribute this to a drama teacher I had in middle school, Tyrone Wilkerson, who chastised those of us in class for squandering our time. He gave a compelling and inspiring speech about filling every moment with something that feeds our brains, our souls or both. I have tried to live my life with that speech propelling me forward. Like many people in our wonderful community, I believe I found Steampunk long before I found the term. I remember watching the classic Disney adaptations of Twenty Thousand Leagues Under the Sea and Journey to the Center of the Earth with great glee. I loved the aesthetic and the costumes. I wanted to be in those places. As I was older, I began to seek out books that captured that same feeling. For quite sometime I had quite the challenge tracking them down. I didn’t quite know how to describe them to librarians, and of course, I’m old enough to have lived before searching by internet was a possibility. It was The Difference Engine by Sterling and Gibson and then Death of a Necromancer by Martha Wells that finally introduced me to the term. From there, it was a few years before I discovered that there was an entire subculture that had sprung to life. The internet was certainly a boon in that exploration, often making a community that would have been too far away very accessible. For my costumes, I like to start with a scenario, activity, or destination that drives the function and then look of the costume. For instance, I might have a client who wants to be a lady airship captain. Rather than doing a visual search of modern costumes by other designers – whose work I love but I never like to emulate too closely – I go to the historical record of the nineteenth century. I start by doing a visual search of photographic plates or drawings. In this case, I would start by searching for female adventurers of the era or female military costumes. An airship captain, after all, would need to be able to move practically and efficiently on her ship. The visual search might send me down the trail of particular historical figures and how they managed to live and work in their field. Often there will be more pictures and some historical notes about why they wore this or chose that equipment. I take all of those details and throw them into the blender of my imagination, and then add in what I know about the particular character of my client. From there I often do some sketching to try to capture what I’m envisioning. I have been incredibly fortunate to meet many amazing humans. These individuals have inspired me in countless ways, and the list is extremely long. However, there are several particularly inspirational figures in my life. My grandfather was an inventor, engineer, independent thinker, and one of the most genuinely gracious humans I have known. He taught me how to build things in the workshop, how to dream about design, and to believe that everything was possible. He also told me when I was very young to remember that every human was born the same and that it was our actions that set us apart. My dear mentor, Carlos Tuttle, in high school provided me with a great deal of life coaching which I believe saved me from treading down a path of bitterness and self-serving. When I was distressed that I could never repay him for his support, he agreed that I should in fact not even attempt to repay *him* but to pay back my debt by helping others in the future. My dear Aunt Kristi has forged a life of art and happiness. I have watched her dedicate herself and find a balance that is true to her vision even while it may not always be a secure or easy road. She taught me what it meant to pursue work as an artist. Finally, for this very short list, my dear teacher, Mrs. Grongberg, showed me the power of intellectual integrity and words, especially poetry, and opened my mind to a new way of seeing the world. When life has been difficult, I have been able to return to those lessons and find some poem that lifts my soul. Honestly, life as a performer. In my early 20s, I gave up pursuing a career as a performer for a host of reasons that seemed very sensible, wise, and practical at the time. That decision left a hole in my heart. In this later phase of my life, I have had the great gift of performing again, regularly. I am humbled and frequently in awe of that gift. That, of course, has been mostly a metaphysical adventure. I think in a more real world sense one of my greatest adventures was driving to the Grand Canyon by myself when I was 21. It was August, terribly hot and dry, and I had absolutely no idea how to prepare myself. I was terribly poor, packed too little food, did not take sufficient water, and I was driving the most terrifying old car. (I bought it for $600 which at the time was a princely sum for me.) I strapped my trusty Godzilla figure into the passenger seat and drove. It was incredibly beautiful country. I had hours to myself and I remember very fondly singing at the top of my lungs with all of the windows rolled down because there was no air conditioning in my car. The Grand Canyon itself is beautiful beyond my ability to describe it, but it was the sheer act of surviving the ride and knowing I could so entirely depend upon myself, even ill prepared as I was, to make my adventure happen that was the sweetest part. Currently, I am very fortunate to have an extremely full queue of projects for clients and backers. I’m making a variety of tea duelling sashes for people I truly adore, several waistcoats for gentlemen who deserve to be dressed to the absolute nines, and a couple of corsets. I am especially thrilled about the corsets as one is for a client who has never owned one before and another is for a friend who has weathered a rough few months. 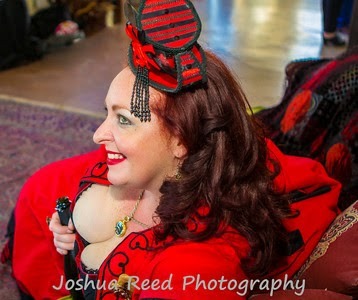 I may also get to work on a Japanese Steampunk ensemble, including a corset obi, and I hope a summer weight ensemble for Madame Askew will soon be in the works. Being a Steampunk can go far beyond the simple costumes and accoutrements that we all love. Find who inspires you and encourages you rather than those who would tell you how to do things only their way or that tell you only what you are doing wrong. Learn the difference between constructive criticism and unkindness. Read. Read about your passions and those who have gone before in your field, read the technical materials of your particular vocation, read the fiction of Steampunk or whatever inspires your imagination. Fill your mind, build up your spirit, and do not be afraid of being smart or authentic. Beyond that, ask questions and learn to listen. Listening does not mean agreement with all that you hear, but it does provide time to actually judge the merit of information. If you meet those who refuse to answer your questions, there will be others who will step up to the challenge.